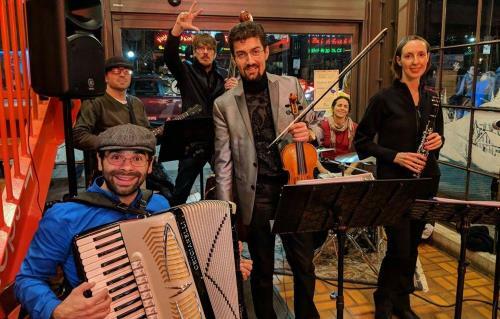 Rollicking Eastern European dances, such as freylakhs, bulgars and horas are brought to life by the Ann Arbor based Klezmer band, Klezmephonic. Their old world sound will get the new world crowd dancing in no time. During the concert, Dr. Karapetyan will talk about the history and cultural influences of Klezmer music. Klezmer is a musical tradition of the Jews of Eastern Europe. Played by professional musicians, the genre originally consisted largely of dance tunes and instrumental display pieces for weddings and other celebrations. In the United States the genre evolved considerably as Yiddish-speaking Jewish immigrants from Eastern Europe came into contact with American jazz. In the second half of the program, professional dance leader and instructor, Deborah Denenfeld, from Louisville, KY, will invite the audience to enjoy the music of Klezmephonic as dancers. Deborah’s experience with traditional Jewish dance began long before she started teaching folk dance in 1992. Raised in a Jewish family, some of her earliest memories involve dancing at Family Club dinner dances, weddings and bar/bat mitzvah celebrations. In her twenties she immersed herself in the world of traditional Judaism, often dancing at Chassidic weddings and Shabbat celebrations. Now she leads contra dances and a project for veterans called, Dancing Well: The Soldiers Project.